Gideon Balloch accounted for all of McGill’s scoring as the Redmen defeated Concordia 22-10 to capture the Quebec University Rugby League championship at Molson Stadium last Sunday. 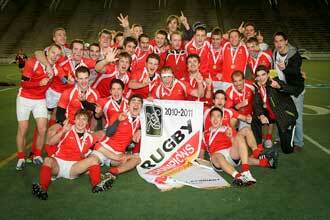 It was the fifth consecutive QURL crown for the men’s rugby team. The McGill Rugby Redmen celebrate another QURL championship after defeating Concordia 22-10 in the title game last Sunday. The championship is the team’s fifth in a row. / Photo: Anrdew Dobrowolskyj/McGill Aktletics & Recreation. Gideon Balloch accounted for all of McGill’s scoring as the Redmen defeated Concordia 22-10 to capture the Quebec University Rugby League championship at Molson Stadium last Sunday. It was the fifth consecutive QURL crown for the men’s rugby team and marked McGill’s third intercollegiate banner of the fall season, joining women’s cross-country and men’s baseball (which captured a national title). Balloch, a 21-year-old mechanical engineering senior from Beijing, scored three tries, converted two of them and added a penalty goal. “The last couple of years, the games haven’t been that close, so this championship is really up there for me,” said Redmen head coach Craig Beemer, a McGill grad who played football and rugby for the Redmen and has been part of the team’s coaching staff for more than a decade. “The focus on the team this year was really unbelievable. From Game 1 to today, the team improved every week and this is a tribute to them,” Beemer said. Balloch, who enrolled at McGill in 2007 out of the International School of Beijing, was named the De Facto Quebec university male athlete of the week for his efforts. -With files from Earl Zukerman, McGill Athletics & Recreation.